STRADER: I’ve love sitting behind dugouts. You can heckle managers – Go back to Japan! – cheer favourite players, and hey, when the dancing birds are out, it’s nice to be close enough to get a T-shirt. 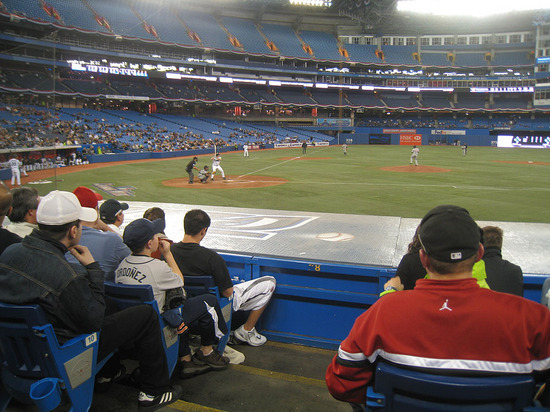 So, when I go to the SkyDome (Yes, I’m sticking to SkyDome, Rogers) I always ask about the availability of seats along the third base line. And until my buddy Brent brought it up to me, I always thought the home dugout was along the third base line. And if it isn’t, why isn’t it consistent, who gets to choose, and why? It turns out that it isn’t consistent at all, in fact, far from it. The home dugout is wherever the home team wants it to be. Major League Baseball does not appear to have a rule on it. Wiki experts note this, and with a quick look up myself, I couldn’t find anything on it. So if any of our twitter followers know, respond. We know there are a few players out there so chime in and let us know what you prefer and why. In the early days of baseball there weren’t as many coaches on a team. Managers could also act as base coaches, and whether the boss liked to advise on the first or third base line could have swayed his choice of dugout locations. Where the sun falls during day games is also a great reason why a manager might favour one or the other. Maybe he likes to keep his players footsies warm? Maybe he wants to steam out the opposition? I would recommend metal benches and conveniently faulty water taps to add to this strategy. It turns out first base is favoured on the American League side (eight to six) and third base is favoured in the National League (10 to six). And the cathedrals of baseball, Wrigley and Fenway, differ in their approach. The Sox sit on the first base side, the Cubs sit on the third. Wiki also notes that some parks simply have one dugout built larger and nicer than the other, with the Nationals RFK stadium as a blatant example of this – the home team picking the bigger and nicer location of course. Personally, I would have a sound engineer in for one game (Why not? If teams spend money on guys sitting in the outfield with white signs for balls and strikes I can waste $20,000 on a sound consultant, can’t I?) and have him determine which dugout allowed the home plate umpire to hear me, the manager, the best.